Cape Cod has so much to offer, on land and on the water, so it can be hard to figure out what to do and where to go. If you want to go and explore some of the waterways, a guided kayak tour can be the perfect way to go. A tour guide can provide insight into the area and will know all the best spots! 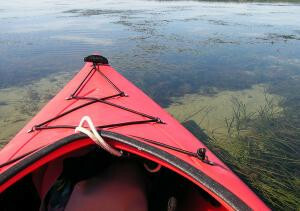 Great Marsh Kayak Tours offers several different tours, from Nauset Marsh to a Sunset Spectacular on Cape Cod Bay. For more information and reservations, call 508-775-6447. Cape Cod Kayak also has several different tours. To see their tour schedule, click here. Call 508-563-9377 for more information and reservations. Rideaway Kayak offers kayak tours, as well as SUP tours. The tours can be booked online. Call 508-247-0827 for more information. Cape Kayaking offers tours during the summer (and tours can be arranged by request prior to Memorial Day). The Chatham Kayak Company offers tours mostly on Oyster River from their dock at the end of Barn Hill Road, but they are also willing to rent customers kayaks and deliver them for tours elsewhere, according to Anne of CKC. Take a different view of the Cape on your next vacation, kayak with a guide. John Fitts photo.